At last, the first true petite lab coats for female clinicians! Exquisitely constructed to flatter anyone 5 feet 4 inches or under, the Ellody fits like a custom tailored suit jacket. First lab coat that I didn't need to send for alterations. Fits well in all dimensions- length, waist, shoulders, sleeves. True 00. Good quality fabric. The material is thick and comfy, which is perfect for the freezing medical offices! I use this in a laboratory setting. Stain resistant, easy to wash, very fitted. I am a 00-0 in most pant sizes and wear an extra small. The shoulders were a bit narrow, but it was true to the sizing online so I knew it would be that way. Very crisp and clean, have received many compliments. A nice change from the worn out and stained lab coats here! I've been a fan of Medelita ever since I received my first Ellody coat, and this is my second one! The fit is perfect, and the quality of the fabric holds no comparison to what is typically found at any old scrub store. I promise you won't be disappointed in your purchase. Love my new coat! Slim fitting... but fits what I need to get through clinic (large iPhone and a large dermatoscope). Have gotten compliments on it! I love this feminine white coat. I constantly get compliments for it. The material is super durable and easy to clean. It remains a bright white unlike other white coats. This is my second M3 Ellody. I love the fabric and the fit. It is extremely comfortable and looks very professional. My coworker recommended this brand due to the coloring staying white rather than fading yellow. I’ve worn it over my usual office clothes for two weeks now and love it. The color is definitely a crisp white and the material is a sturdy yet breathable type. I usually wear medium tops so this medium size 8 coat fits well but is more comfortable moving around with a tank top/shell/short sleeve underneath. It feels a bit longer than I like. I’ll probably buy my next one a bit shorter and hope that Medelita has one. Q: If I were to order a coat with embroidery and it didn't fit well, am I able to return it? We appreciate your question. Unfortunately, we do not accept returns or exchanges on embroidered items. However, we do offer a 'Try it on at home' policy, which is a popular choice among customers who request embroidery. Before we embroider, we do suggest trying on the size of your choice. We then provide a free return shipping label for customers within the US. Once you decide on a size, you are welcome to use that return shipping label to send your order back with embroidery instructions for us. Q: If I purchase a coat to try on, would I be able to send it back to get embroidered? Yes, as long as you are located in the US we will be able to provide you a complimentary return shipping label so you can send your coat back for embroidery or exchange. If you have questions or need help you can always reach out to our Customer Experience Team at 877.987.7979 Monday - Friday from 8:00 am - 5:00 pm, PST. I am reading the size guide and the reviews and I see a huge discrepancy between the sizes and what people say and what I came up as my size! I am 5 '2" and about 120 Ibs but the size I got through measurements and your table is 4 . The reviews even say they had to get a size 0 at the same ht and wt ! !I am really confused! Maybe I have to look elsewhere as I live in Canada and the shipping cost is too high to have it exchanged in future. A: Thanks for your question! I think anywhere between a 2-4 is best based on the information given. It would be better for you to use the size guide as your body type will really be the deciding factor here as opposed to weight and height. I encourage you to call us so we can get a better description of your unique shape...Many customers use their dress size as a guide, as our sizes are very similar to top brands in the clothing. Q: I got the size 4 and size 6 to compare the fit. The size 4 was fitted and snugged around the arms but doable. The size 6 was not as well fitted but gave more room around the arms to move easily. My concerns is how much the coat would shrink after wash? The front page stated 1% and the care guide stated 2-3%. Should I consider the larger size to foresee the shrinkage, especially around the arm area? Please advise. Thank you! A: Thanks for your question and I sincerely apologize for the confusion. We have since updated our care cards to reflect a major change in expected shrinkage in the sleeves with the M3 fabric, which is no more than .5" (one-half inch) at the very most. Elsewhere you shouldn't see any shrinkage after washing. I strongly recommend keeping the size 4 if you're comfortable, as you shouldn't expect to see any noticeable shrinkage with the new fabric. Please let us know if you have any additional questions - and again, I apologize for the confusion! Q: Is it possible to have the back belt detail stitched lower, more at the natural waist? The height at which it is stitched is above everyone's natural waist and gives the coat an infantile look imo. Thank you so much for your question. The waist belt on the Callia, Ellody, Emma and Estie (the side belt detail) is at the true waist. So that is not below the belly where your typical jean pant line would fall. It is at the bottom of the rib cage. It is considered a very flattering area to “break up” with a belt or with seam detail on a garment. So it seems to be (my best guess without knowing your height) that you are perhaps a taller female, more than 5’4” (the height of the petite fit model for Ellody), and so the waist of the Ellody belt ends up too high on you. 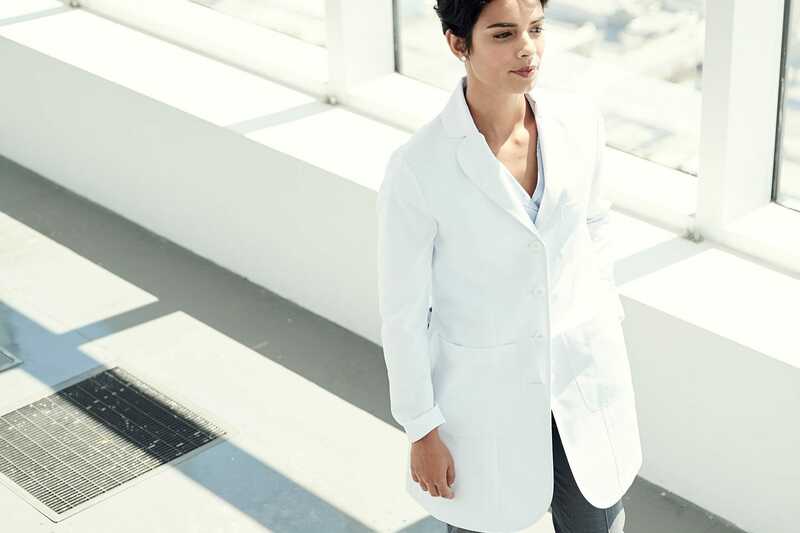 The Ellody lab coat is very special, in that it was truly made to fit someone 5’4” or under. It used to be a regular coat, but we were able to work with the most popular petite fit model in LA, who helped guide us toward proper placement of pockets, pocket depth, true waist, lapel/collar break placement on the chest, side vent placement, etc. All of these were adjusted for a true petite fit. The Ellody happens to also look really nice on someone up to 5’6”, and I think everyone would agree. But it is truly a petite fit lab coat, designed for someone 5’4” and under. 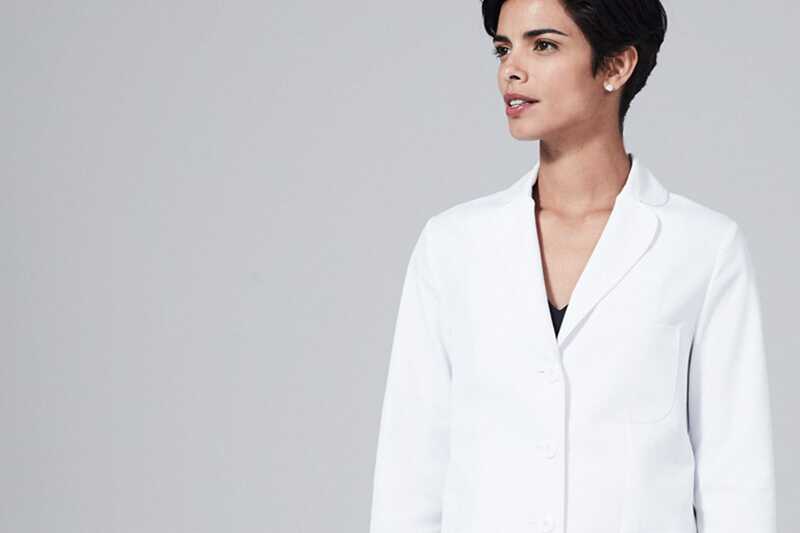 I hope that answers your question - for better placement on your waist, I would definitely recommend that you try on the Callia lab coat and let us know what you think! Q: Do these need to be ironed? A: Hi Sharon, I apologize for the delay on this answer! The answer is no, it is not necessary to iron these coats as they feature wrinkle-resistant fabric that releases wrinkles very easily - some tell us that they like to take a cool/warm iron to it or use a quick steamer just for good measure when the coat hasn't been hanging up for a while, which is perfectly fine to do and based on personal preference.